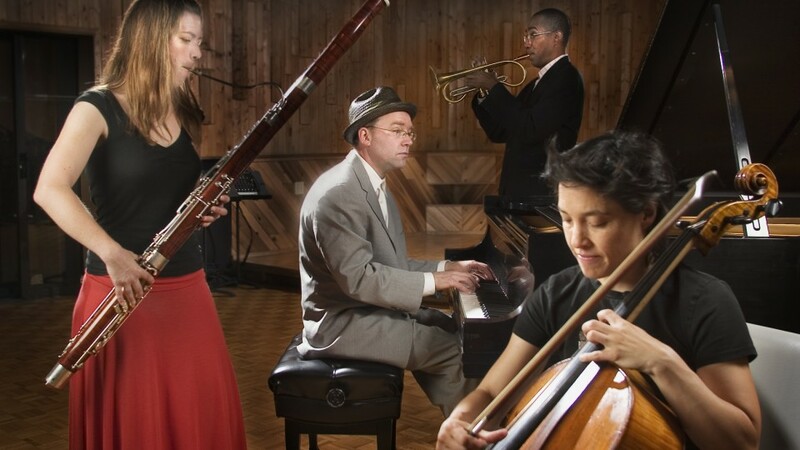 Bringing together four uniquely defined voices of new music, jazz, and improvised composition, Gravitas Quartet explores the depths of texture, sonority, rhythm, and ensemble fluidity available to masters with a broad palette. Wayne Horvitz, Peggy Lee, Sarah Schoenbeck, and Ron Miles have been hailed as forerunners of modern music – each journeying from their vast musical backgrounds to redefine the sonic landscape. The ensemble has two CDs: Way Out East (2006) and One Dance Alone(2008), both on the Songlines label. The CDs are available at record stores, online, and here at the Shop page. Way out East is a beautiful and quietly moving and poetic recording; one that will sound fresh and new decades from now. Horvitz and his players have shown that ‘improvised’ or ‘new’ music can be utterly lovely to listen to. Whether drawing upon the blues or a waltz, Horvitz is not simply manipulating a template, but creating a time-warped ambience, in which the listener feels a stillness that is languid and foreboding. The idiom-free improvisations provide ballast, preventing the album from sinking into sentimentality. Peggy Lee, Ron Miles and Sara Schoenbeck are exquisitely balanced, their every detail precisely etched. For the most part, they are slightly understated in the improvisations; when they move to the foreground, they are persuasive, as is Horvitz. The Gravitas Quartet occupies a conceptual no man’s land somewhere between nostalgia and the future, where pensive, minor-key piano excursions are joined by stately cello, regal bassoon, ghostly trumpet and burbling electronics. Way Out East perfectly assimilates Horvitz’s bittersweet melodies and sci-fi futurism into a synchronous sound world all his own.